Thinking about a remodel for that old wooden barn sitting unused on your property? Here are a few things to consider when planning for a barn conversion. The idea of restoring an old barn into a rustic barn house might sound great in theory, but most of the time it’s a lot more costly and painstaking in practice. The biggest barrier to a barn remodel is without a doubt financial. Hidden expenses will crop up in the form of things like fumigation costs and re-engineering fees. In other words, it won’t take long for the cost of the barn conversion to exceed the cost of an entirely new barn-style home. If you’ve got an endless cash flow and a zen-like capacity for headache-inducing regulatory hiccups, then maybe a barn conversion is for you. If you’re like most people, however, you’ll probably prefer the path of least resistance. Before you begin to plan a barn remodel, it’s important to identify whether your barn is even worth converting. If your structure is a pole barn, don’t even bother. Pole barns have short life spans because they rely on treated wood posts in concrete in lieu of a proper foundation. This means that, regardless of what chemicals are used to protect the lumber from the concrete’s moisture, the posts will inevitably rot. As such, appraisers, banks and lenders do not always recognize pole barns as permanent structures. This complicates financing requests for your already spendy barn conversion. Further, many pole barns are not properly engineered to meet the structural requirements necessary for a residence. And good luck getting permits for that kind of project! To add insult to injury, you’ll likely need to hire an architect or structural engineer who can create blueprints of the existing barn. If you don’t have the old plans, you can’t get permits or accurate bids for the new plans. Even if the barn you’d like to remodel has a proper foundation, existing blueprints and adequate structural integrity, there is yet another roadblock to make you wary. Six-legged pests such as powder post beetles will wreak havoc on the timbers that support your barn. Fumigation is expensive enough, but costs will be astronomical if you delay the process until after your old barn has been remodeled. Would the financial burden and logistical nightmare of vacating your residence be worth that rustic barn conversion? 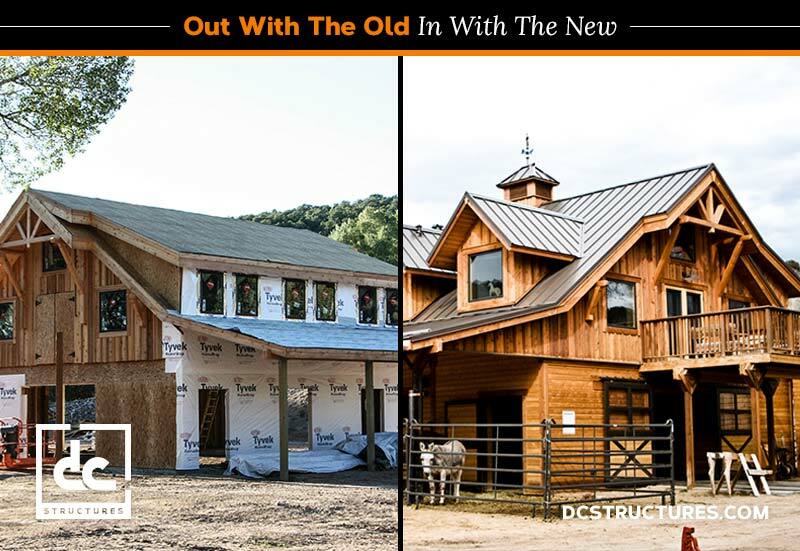 DC Structures offers a diverse and highly modifiable line of post-and-beam building kits that will stay standing for two-to-three times longer than their pole barn counterparts. Whether you’re looking for a barn-style home, hybrid apartment barn, or a workshop or garage with living quarters, DC Structures has a kit to suit your lifestyle needs. Our pre-engineered barn home kits are both efficient and cost-effective. We offer our clients the benefit of a rustic barn aesthetic that is built to last—all without the headache. Request our digital catalog for a better sense of how we can make your barn house dreams come true.